Poul Henningsen, 'Snowdrop' desk lamp, model 2/2 in brass with amber colored glass shades. 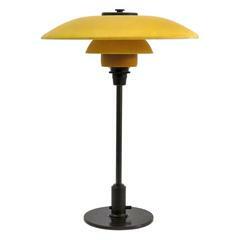 This model manufactured 1931–1933 by Louis Poulsen, Denmark. Stamped 'PH2 PATENTED'. Literature: “Light Years Ahead”, ill. p. 164. 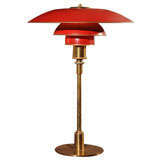 PH 4/3 table lamp with brass frame, red painted copper shades inside with reflector painting. Stamped Pat. Appl. 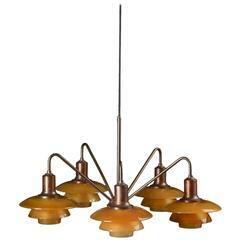 Manufactured by Louis Poulsen, 1927-1928. PH 3/2 table lamp with shades of mat glass and frame of burnished brass, designed by Poul Henningsen and manufactured by Louis Poulsen in 1928. Table lamp, model 3/2, with black frame and opaline glass, designed by Poul Henningsen and manufactured by Louis Poulsen. The lamp is from the 1980s and in great vintage condition.